Sara Netanyahu, the wife of Benjamin Netanyahu, faces criminal charges for misusing public funds. But much of her family is under scrutiny right now. Sara Netanyahu, the wife of Israeli Prime Minister Benjamin Netanyahu, is likely to be indicted on fraud charges, Israel's attorney general said Friday. Sara Netanyahu was officially notified that she's accused of using tens of thousands of dollars of taxpayer money on private expenses. But before being indicted, the prime minister's wife will be given a chance to plead her case at a special hearing. Israeli police questioned Sara Netanyahu all the way back in 2015, but they didn't recommend indicting her until May of last year. The possible indictment adds to the legal trouble facing her whole family. 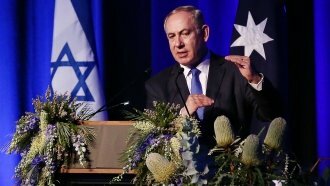 The prime minister himself is a suspect in cases of bribery, fraud and breach of trust, according to Israeli police. And last month, one of Netanyahu's former chiefs of staff signed a deal to become a state's witness in two corruption cases against the prime minister. Others close to Netanyahu are also under legal investigations. The prime minister's personal attorney is being investigated for taking bribes. And another former chief of staff was suspended from the country's communications ministry after being accused of providing confidential information to Israel's largest telecom company. Then there's Netanyahu's son. Last month, Yair Netanyahu was sued for libel after he called a left-wing think tank a "radical anti-Zionist organization." The prime minister has denied the accusations against himself and his family and has claimed the whole thing is a witch hunt by a hostile media.